UK’s The Duke Spirit will unveil a few new songs during special shows in New York and LA in the coming weeks. The Duke Spirit are scheduled to co-headline the KCRW Halloween Masquerade Costume Ball on October 30 in LA before arriving in NYC for a one-off performance at Santos Party House on November 3. Their latest 3-track EP, Kusama, will be released exclusively via iTunes on December 7th, with the full length album due for release in February 2011 on Shangri-La Music. It’s their first release since 2008′s stellar Neptune. 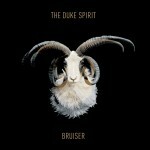 Hear new song, “Everybody’s Under Your Spell”, on the band’s site at www.thedukespirit.com now. It’s not hard to see why this flash, always-decked-out band was invited to NYC during Spring Fashion Week, where they played at the Y-3 Adidas show. Besides this, designer Philip Lim has cited Liela Moss as his “modern muse” and the late Alexander McQueen was taken by the flaxen-haired, sultry Moss and her dark, glam style that she became part of his inspiration for McQ, his 2009 Target line. The Duke Spirit will be playing an invite-only show, sponsored by Levi’s, on November 4th in NYC.